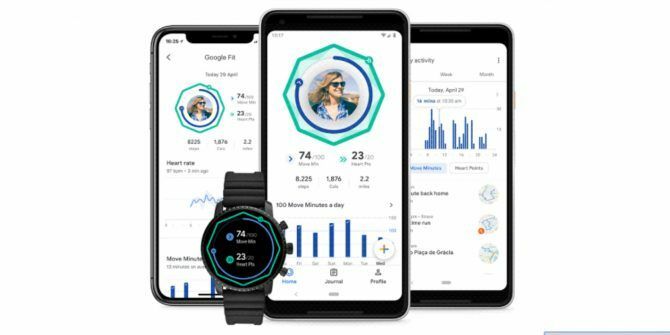 Google is rolling out a new version of Google Fit, its fitness tracking app for Android and Wear OS. The updated Google Fit has a new look and feel to it, but things have also been changed under the hood to help you achieve your health and fitness goals 5 Fitness Challenges to Lose Weight and Get Healthy 5 Fitness Challenges to Lose Weight and Get Healthy Fitness and health are always a priority. Start the good habit with these five 30-Day challenges that can be done anywhere without any equipment. Read More . The new Google Fit is centered around two activity goals: Move Minutes and Heart Points. These have been conceived based on recommendations from the American Heart Association (AHA) and the World Health Organization (WHO). Move Minutes are awarded every time you’re active. The idea is that this will make you more likely to take the stairs or go for a walk while you’re on the phone. Heart Points are awarded every time you get your heart rate up without needing an intense workout. These Move Minutes and Health Points will be tracked via two concentric rings. If and when you hit your goals for both they’ll form a jewel shape. This kind of gamification may sound dumb, but it’s surprisingly satisfying to achieve your goals for that day. As you use the app you can change your goals to reflect your fitness levels. You’ll also be able to track your runs and bike rides, and receive customized tips from the new coaching feature. All of which should help keep you focused on getting fitter and healthier. At first glance the new Google Fit looks to be a major improvement. The two simpler and smarter activity goals make sense, and it looks great too. The new version of Google Fit should start rolling out to Android and Wear OS over the next week. Whether or not you use Google Fit, there are plenty of ways of tracking your health and fitness these days. Why not try these workout apps to get fit for free? Or how about these websites to help you understand your health and fitness 5 Remarkable Websites to Help You Understand Your Health & Fitness 5 Remarkable Websites to Help You Understand Your Health & Fitness Do you want to understand your body, and how exercise and nutrition affects it? These five quality websites will help you reach your fitness goals with education. Read More ? Explore more about: Android Wear, Fitness, Google, Health. I have used canva so many times and found it to be the most useful. The loss of the steps home screen widget is a critical failure. The app is harder for me to use now... Tasks like entering my daily weight take more effort. Those were the two main uses of the app for me, now messed up. I hope they fix it soon. I also don't care for the heart point junk either. Just show me my activity and weight like it used to. I agree with you. I liked it better the old way. I've also noticed, that while the old google fit wasn't always 100% accurate, the new version seems even less so. Took a 1.5 mile walk this morning and it only logged it as .97 miles. I could care less about move points and heart points. I use Google fit to track my runs and walks, steps for the day. Felt like the old version was easier to use.